The Rough Translation podcast explores how ideas we wrestle with in the U.S. are being discussed in the rest of the world. Two days before my first trip to Afghanistan, in 2007, I was terrified, speaking no Dari and having never interviewed anyone in a war zone. On impulse, I grabbed my little red travel accordion, mumbling something about using the "universal language of music" to connect with people whose world seemed wholly different from my own. A week later, in Kabul, when I finally got up the courage to play, my interpreter (and later dear friend) Najib Sharifi turned to me in wonder: How did I know Afghan music? he asked. I demurred. "These are just some old songs my mom used to sing," I told him. Later, though, I would understand a deeper lesson: While we rarely find a "universal language," we can, if we're lucky, stumble on bridges between one national experience and another. In these rough translations across culture and geography, we get a new perspective on things we thought were all too familiar. 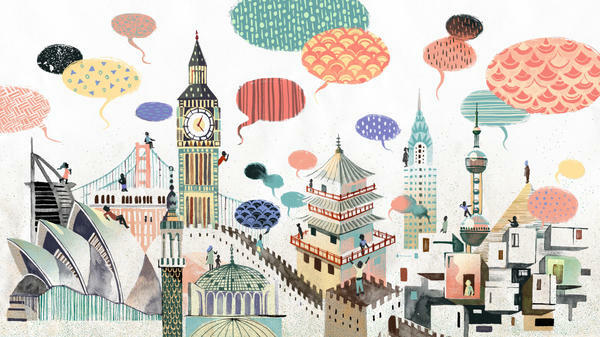 Rough Translation is a new international podcast from NPR. Each episode, we go to a different country to drop in on a story or conversation that reflects back on something we're talking about in the United States. These are familiar conversations in unfamiliar territories: A Syrian refugee hires a flirt coach to decode the culture of romantic love in Berlin. A team of Ukrainian journalists tries to invent a "vaccine" against fake news from Russia. A baby is born and the adults around him must share tears through Google Translate. NPR's international correspondents don't just report what's happening in a place. We try to translate what that news means locally. In Afghanistan, a tear shed by a president during a political speech may have seemed to me like an unremarkable moment of political theater, but sent shock waves across the country. Meanwhile, the things that shock me may leave locals underwhelmed. We know that people often frame their stories differently for curious foreigners than they do when telling that same story to neighbors. Most of us at one point have probably been either the curious foreigner or the local storyteller. It's one of the wonderful and frustrating things about being a correspondent overseas. You might be squeezed into a woman's kitchen, hearing a traumatic tale that her neighbors would shame her for sharing, but that she feels relieved and grateful to confide in you. Those are awesome moments shared with a stranger. But at other times, your foreignness cuts the other way. You can hear the story being curated to what they think you want to hear. You watch your own assumptions clouding the picture. For good or ill, your outsider-ness is part of the story. Usually, it's the part of the story that's hardest to tell. The weekend violence in Charlottesville, Va., has many of us waking up this morning thinking about our country, its difficult history with race and how this moment fits into that history. Racial divisions play out differently around the world. For example, the way Brazilians talk about race can be pretty shocking to an American ear. GREENE: Well, today NPR's launching a new podcast. It's called Rough Translation, and it brings overseas' perspectives to American conversations. It is hosted by Gregory Warner. MARTIN: And today how some people in Brazil suddenly see each other and themselves very differently. A national effort to correct racial inequalities has Brazilians asking who is black and who decides. PEDRO ATTILA: Come on, boys. GREGORY WARNER, BYLINE: Pedro Attila is 44, Brazilian, lives on the far outskirts of Rio. ATTILA: Living the humble life. WARNER: And if you ask him to describe his race, he laughs. And then he gives you a list of features. WARNER: He says he has a potato nose, black guy's lips and white guy's hair. WARNER: This is a very Brazilian answer. Many here like to talk about race as no more significant than having blue eyes or brown. But Pedro's family photos tell a different story. ATTILA: This is me a toddler, as a toddler. WARNER: First himself, an olive-skinned little boy. ATTILA: They were white. They was pale. WARNER: They're actually whiter than me. But the third picture in this box is one of Pedro's mother's brothers and her sisters. And all of them are dark-skinned. ATTILA: The black part of my family, and my mother is white. WARNER: Here is the paradox of Brazil. Even though the country has one of the highest rates of interracial marriage in the world and many people will tell you that race does not matter, there are stark disparities between light- and dark-skinned Brazilians. And this affects how you're treated in a store or whether you're hired for a job or how likely you are to be shot by police. Pedro experienced this racism in his own family. WARNER: He says his mother loved him a lot, but she was very severe. And sometimes she would call him blackie, little black boy when she was very mad at him. ATTILA: I recognized that she - in her mind - this fact, I'm being black, could not be good any time for her. I don't know why because I'm the same skin of her family. But I don't know. People are strange. (Laughter). WARNER: In 2014, Brazil passed a law aimed to address some racial inequalities. It mandated that 20 percent of students accepted to Federal University must be black, also, 20 percent hired for many civil service jobs. MARIO THEODORO: Affirmative action is positive discrimination. WARNER: Mario Theodoro helped pass this mandate. He's an adviser to the Senate. He says he wants to see more black people, like himself, in the Brazilian elite. WARNER: Except when Mario looked at photographs of who was getting hired for these jobs and who was accepted to these universities, he was shocked. He shows me this one photo. THEODORO: (Through interpreter) A photograph of the class of medicine students of the University of Pelotas in the south of Brazil. THEODORO: (Through interpreter) All of them were white. WARNER: And Mario believes because dark-skinned Brazilians experience racism, dark-skinned Brazilians should be in this quota. But who decides who qualifies? The answer to that question led me to an echoey hallway in a government building in Rio with 18 job candidates, who are all applying under the affirmative action quota, all waiting to appear before what's now called an anti-fraud commission. Andrea Guimares looks very nervous. What about you are you hoping they'll see? ANDREA GUIMARES: Well, I hope that they see that (laughter) I'm not white, you know? WARNER: Lots of people here are worried. Their hair is too straight or their color is too light. WARNER: One candidate I met said he searched out his skin tone on Wikipedia. WARNER: And only then decided, yeah, he was dark enough. Pamela Pontes is not so sure about herself. PAMELA PONTES: I don't know what they judge - I mean, the color of the eyes, the mouth, hair? WARNER: She points to her nose. PONTES: My nose is not that big. Does that mean I'm not black? WARNER: I asked Mario Theodoro back in the Senate, what do these judges use to verify someone's race? Do you give them objective characteristics, like the - or subjective? THEODORO: No, it's not necessary. It's not necessary, give a group of characteristics. (Through interpreter) One time, a leader of the black movement in Brazil was asked, how am I going to know who's black in Brazil? And the man responded, ask a police officer. (Laughter) The perfect boundary between white and black people. WARNER: Mario says the job of every judge on the commission is to just try to see each candidate as a racist would see them. But Pedro did not want to see himself that way. He's the guy whose mother called him blackie when he was bad. Growing up, he never thought of himself as black. So what swayed him was that he applied to a job that he really, really wanted and lost out to an affirmative action candidate. So if you had applied in the quota track, you would've made it? ATTILA: Yeah, I would made it. WARNER: You would've had the job? WARNER: That was the moment. He decided he's going to check the box marked black. And he goes on this months' long quest to try to understand what that might mean to him. He reads books in the library on black history. He watches a ton of sketch comedy from America. WARNER: No, You're on time. WARNER: ...He walks in. Inside, Pedro will sit in a chair in front of five people of different shades, and they will ask him just one question, why did you check the box marked black? And his complicated answer will not matter. What will matter is how they see him. Remember that photograph of medical students that Mario showed me where all the affirmative action candidates looked white? Well, once that photo went public, people got really angry. And 24 students from that school were expelled for racial fraud. Racial fraud - it's a thing now in Brazil. WARNER: A few days later, the results of Pedro's commission arrive. Three of the 18 were rejected. WARNER: And as for Pedro? ATTILA: Yeah, I was approved, yeah, on the commission. Yeah. WARNER: He says he hopes to prove that a black man can do a job as well as a white man. WARNER: He says he feels proud that, at 44 years old, he finally checked that box marked black. GREENE: That's the voice there of Gregory Warner. He is hosting NPR's new international podcast. It is called Rough Translation. Transcript provided by NPR, Copyright NPR.